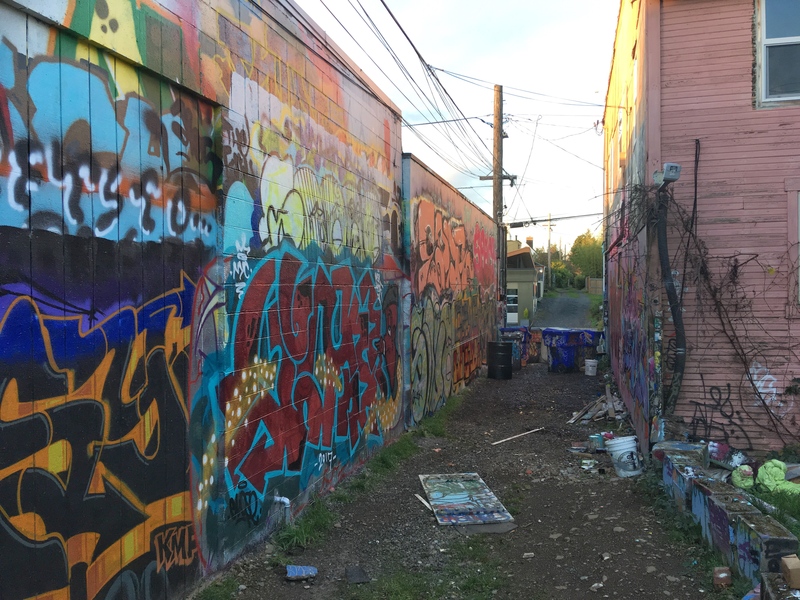 Here’s something you probably have not spent much time thinking about: Northeast Portland alleys. It’s OK that you haven’t been thinking about them—it’s hard to know exactly where they are, some neighborhoods have them and some don’t. And even where they do exist, they might be hidden behind a wall of blackberry bushes, or garbage cans, or yard debris. But now it’s time to think about alleys and to go out of your way a bit to appreciate and understand their history, demise and possibility. Along the way, we should also examine the question of why one neighborhood has them and another doesn’t. Mull that over a bit while we explore this topic. 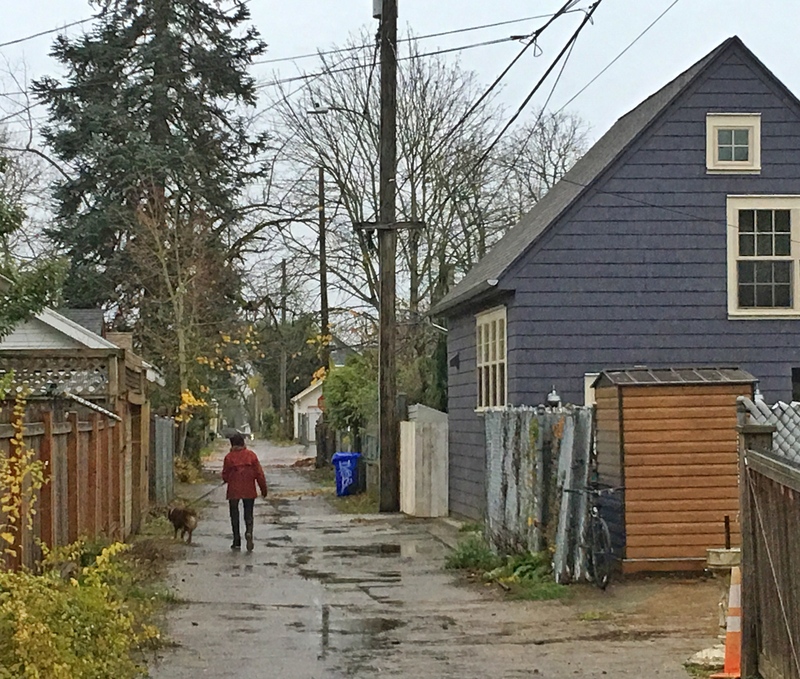 First, an important fact about Portland alleys: virtually all of them are on the eastside. Downtown Portland, known for its small and walkable 200’ x 200’ blocks, has never had alleys, to the chagrin over time of some business owners and public works officials who have complained that our downtown grid makes deliveries and trash removal too complicated and public. If our city blocks had alleys, they’ve argued, those essential but less desirable functions could take place out of view, giving the front of the business more leeway and prominence. Here’s a great map that shows the extent and location of Portland’s alleys. Have a good look at it then come back here and we’ll continue our exploration. There is at least one common denominator in this map’s seemingly random purple grid segments: they exist in neighborhoods platted before 1909. In Portland, as in so many other US cities, alleys were a utilitarian feature designed before the age of automobiles. The barn out back that might have housed a horse or wagon also contained garbage and other chaos that you didn’t want to have out front. But when the car came along—a symbol of convenience, independence and even status—garages began their migration from out back to the front of the house. 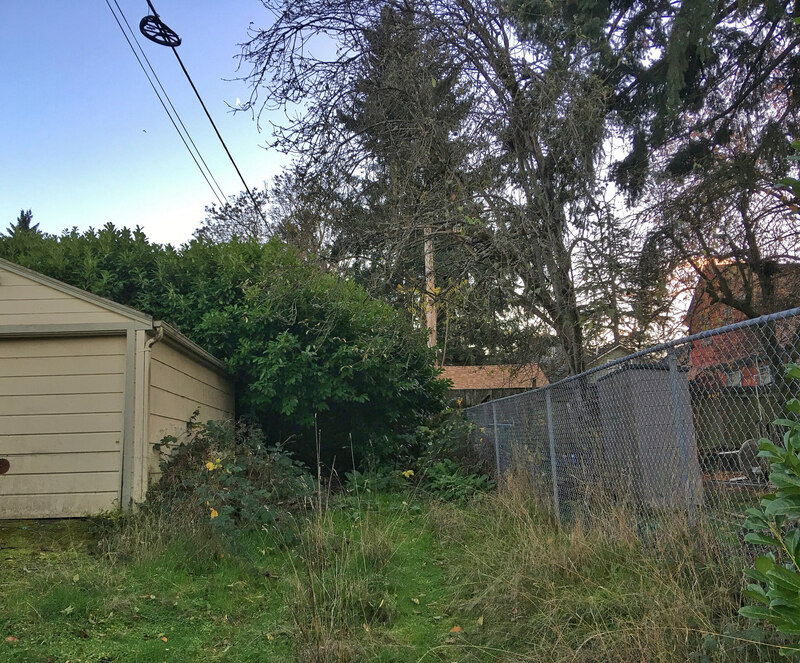 After about 1910, land development companies platting Portland’s eastside neighborhoods responded to this shift by dropping alleys and back garages from their plans. Not incidentally, this allowed houses to be a bit larger and to shift back farther from the street allowing for front yards and landscaping, as well as driveways and garages. Yes, there are other contributing factors at play: Alameda has the ridge, which breaks the rectangular grid pattern. Plus, Edward Zest Ferguson and his Alameda Land Company wanted Alameda to be an upscale addition of larger homes, as opposed to the more compact homes and lots in subdivisions to the north. Irvington, for instance, platted even earlier than all of us above the ridge, does not have alleys. This was a function of the size and siting of much larger and costly homes on relatively constrained lot sizes. It’s hard to have both large homes and alleys given our compact grid. The presence or absence of alleys was central to the question of site and building design, real estate value, and marketing potential at the turn of the last century. Throw in the advent of automobiles and you’ve crossed a tipping point away from alleys in the minds of early property developers. Why bother with alleys anymore? So, there’s our answer to why some eastside neighborhoods have them and some don’t: it’s largely related to timing (pre- and post-1909 as the key date), with the advent of the car looming large, and a few other considerations like targeted market sector and house size. 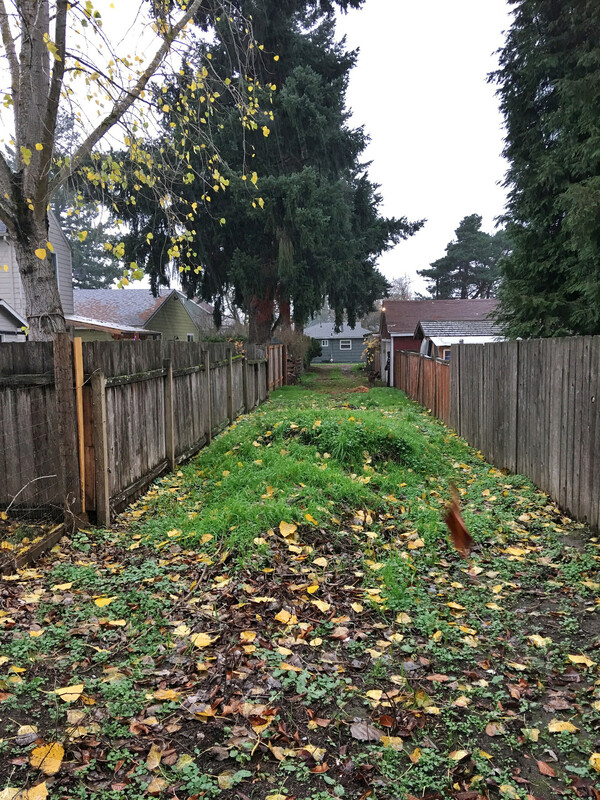 Bottom line is that after 1909, no more new alleys were built on Portland’s eastside. 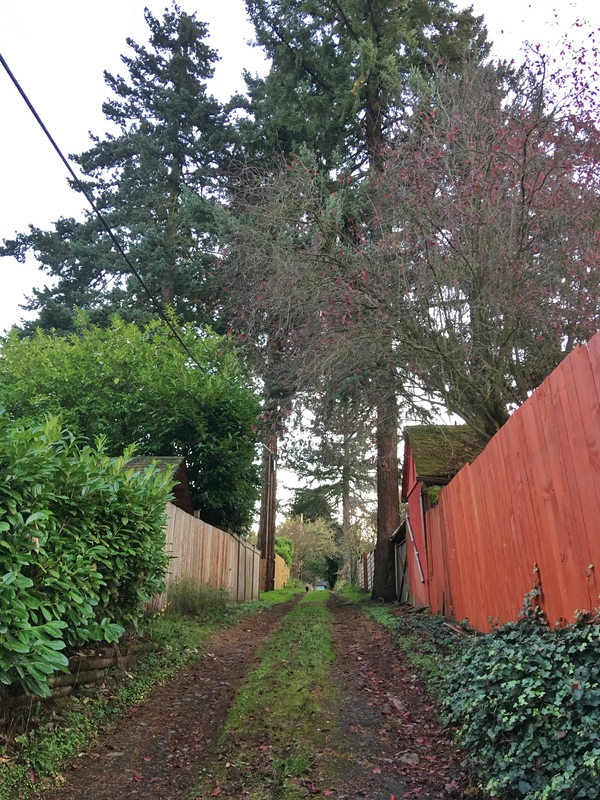 Here in Northeast Portland you’ll find two types of alleys: the obvious ones that are a long straight laneway right up the middle of the block adjacent to back yards and paralleling the length of the fronted street (typically the numbered street). You’ll find these between Prescott and Alberta, from 24th to 33rd. Another form you’ll find is the tee alley, on either side of Ainsworth between NE 23rd and NE 33rd. This form provides a shorter cross alley (like the top of a letter T) that bisects the long laneway. These are interesting to explore and are in pretty good shape. Once you start walking our alleys, you begin to see clues to the past and to future potential, and you can see how different neighborhoods have responded to their alleys. While we haven’t walked every Portland alley, we’ve explored a lot of them, and offer these observations as an enticement. This alley is just off Alberta between NE 29th and NE 30th. Looking a bit like a gallery, the pools of light here illuminate boards that advertise the adjacent T.C. O’Leary’s Irish Pub. It’s an enticing sight. 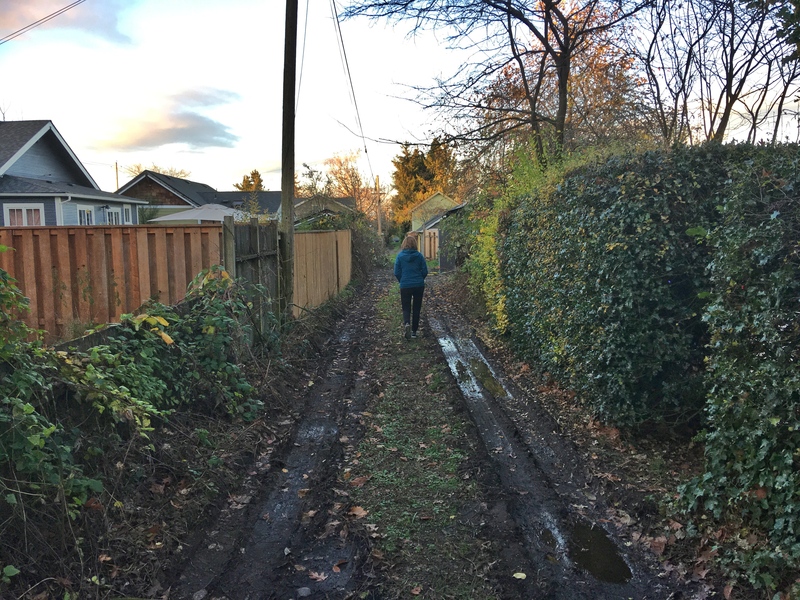 Most of the alleys between Prescott and Alberta from NE 24th to NE 33rd look something like this one: muddy ruts, grass, brush ready to grow over. Here’s one just north of Alberta between NE 27th and NE 28th. The entrance is crowded with garbage cans and recycling bins but adventure up a bit and you see a kind of graffiti gallery. Here’s one that has grown over. Looks like that laurel bush has eaten the garage too. 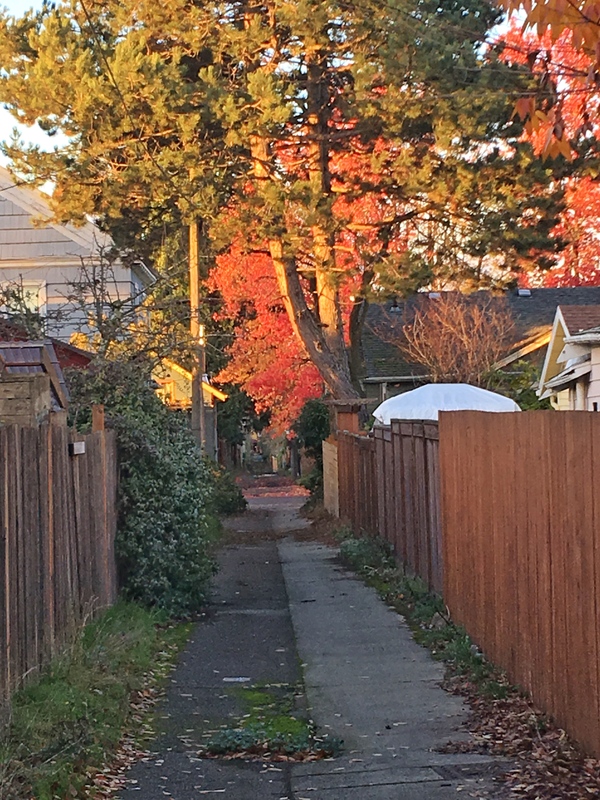 The Piedmont neighborhood has great alleys that run south from Rosa Parks to Killingsworth between MLK and N. Commercial. 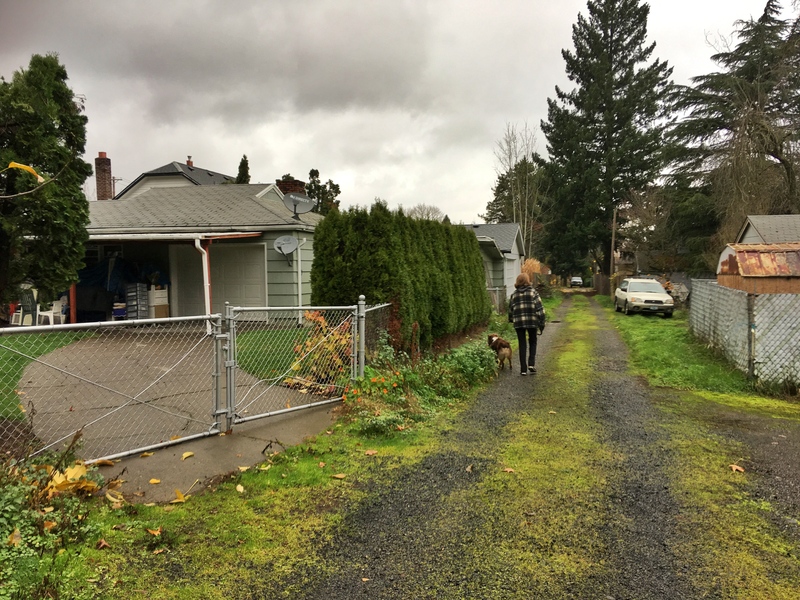 Lots going on here: powerline corridor, pavement and some interesting ADUs. We came across quite a few alleys that had an entry threshold like this one with the gridded pattern scored into the sidewalk. This signaled the alley opening to passing pedestrians. Some alleys like this one in Portsmouth have become debris dumping zones for neighbors, with piles of clippings, dirt and other debris forming impassable mounds. No more cars up this alley. This Portsmouth alley is so well used and traffic-friendly that residents have built a driveway off the alley that seems like a primary entrance to their house. No need for a front yard here. 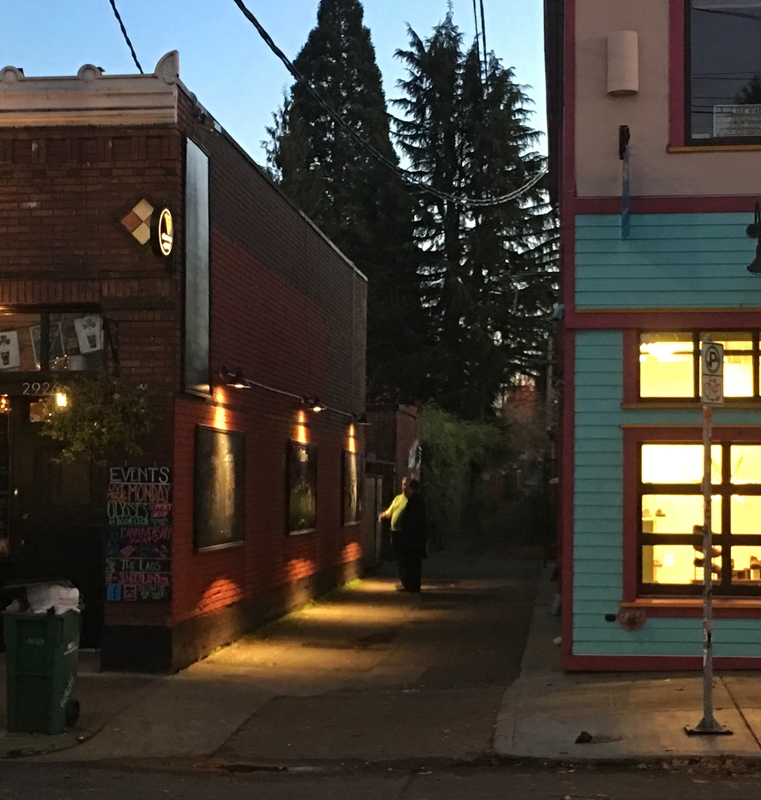 In recent years, there has been a resurgence of interest in alleys as public spaces that connect neighbors and neighborhoods. In many ways they are a hidden resource, public spaces in out of the way places. 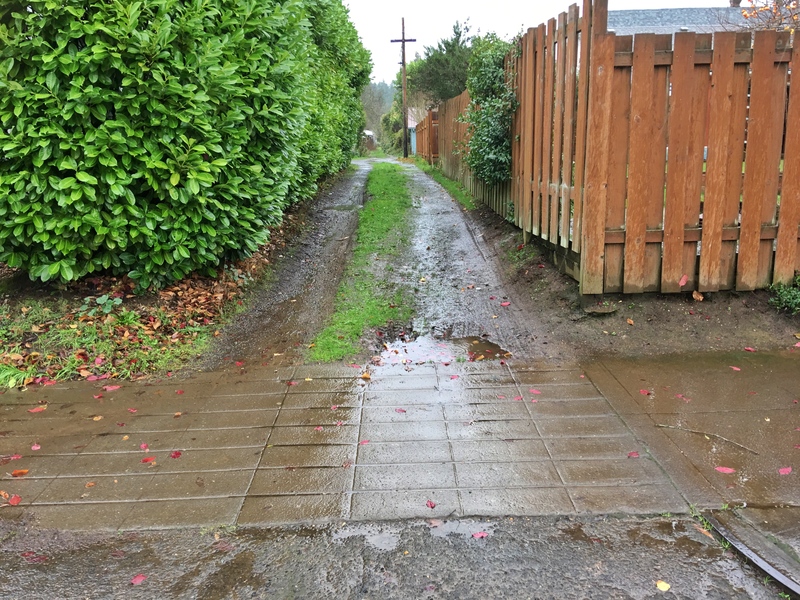 A few years back a consortium of city planners and urban design professionals launched the Portland Alley Project, which led to several alley maintenance and recovery projects. Here’s another great blog by San Francisco urban designer David Winslow with passages from his book Living Alleys: A new view of small streets. Check these out, look at the map and then go for a walk. Get out there into this ready-made local trail system where you can slow things down and experience a completely different neighborhood than the one you think you know. Beautiful! I thought I was the only one who loved all these alleys. I thought they were my husband’s and my little secrets! Glad to know many folks are enjoying them. Thank you for the work involved in sharing this with all of us. Magical! I have always loved the secretive nature of alleys. Fun article! Really good work. Portland has a world of rich urban assets to unearth, enjoy, renovate, recover. Now if only the rest of us across North America could do the same – if only our cities or towns are lucky enough to have an alley or two. I would bump the no alleys after 1909 to 1910 since Laurelhurst has a few. Really wasn’t plated until 1910 and most building was 1911 and on.